Remember when comics were a dime and you could get that first issue of Joe Kubert and Norman Maurer's Three Stooges #1 from the local newsstand? We don't either! It costs a couple hundred bucks now to get that issue from an auction site, and it ain't fair! So, we are bringing back this classic from 1953 in all its original eye-poking glory for today's readers to enjoy. 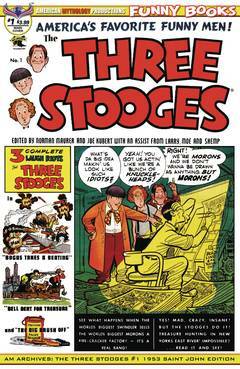 This is the first collaboration of The Stooges and the classic comics duo of Kubert and Maurer and you can get it for 399 cents!.